The report suggests that there’s a direct correlation between Internet traffic growth and lost jobs. That is, the more traffic that is generated on the Internet, the more money will be lost. 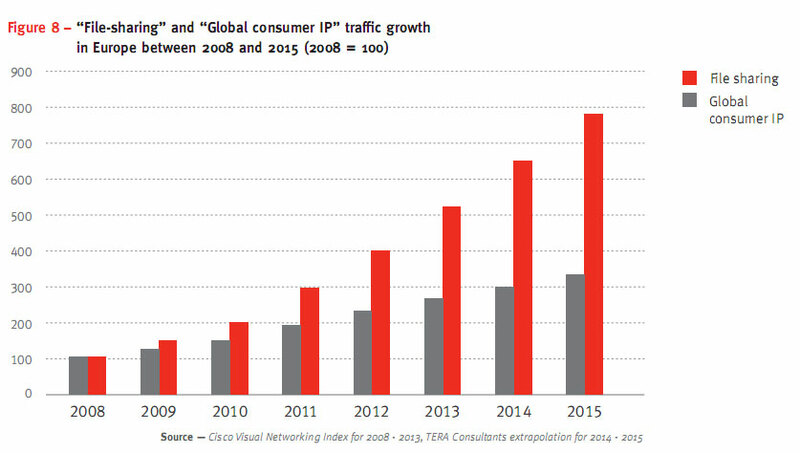 This correlation is 1 according to the report, which assumes that all growth in Internet traffic will increase piracy at the same rate. The report makes another bogus assumption by stating that more traffic will mean more piracy and thus more lost revenue. It does not account for the fact that people might consume higher quality files which are greater in file-size. All projections are based on bandwidth and not the number of pirated goods. The report cites some academic literature which suggests that piracy leads to a decrease in sales. Studies that reported the opposite or a null-effect were carefully left out. This bias defines the entire outcome of the report. If they used studies that found a positive effect they would have found that piracy would create hundreds of thousands of jobs in the years to come. The report uses fixed substitution rates. They assume that 10 downloaded albums results in one lost sale and this figure is not adjusted for the projected increase in piracy. One would think that the public’s budget for entertainment is limited and that the substitution rate would go down as piracy goes up. Related to the previous point, if the industry did indeed lose over €240 billion in revenue by 2015, consumers would have a lot of extra cash to spend. Depending on where this money was spent it might create more jobs than the entertainment industry claims it is losing. As a report commissioned by the Dutch Government showed last year, the overall effect of piracy on the economy might actually be positive. It gets even more ridiculous when we take a closer look at the claims. In the UK consumers spent €6.3 on audiovisual products. If the projected trends continued, the ‘lost’ revenue because of piracy would exceed the actual revenue, meaning that the music and movie industries would end up having to pay people for pirating their products. Lastly, the researchers seem to have trouble putting a decent report together as they messed up the legend of one of the critical figures. In this figure the bars for “file-sharing” and “global Internet traffic” are switched around. This makes us skeptical about the other statistics that are published in the report. This entry was posted in ACTA, General Copyright by cffadmin. Bookmark the permalink.